As you know from my previous post, I LOVE couscous. What is couscous exactly? It’s a coarsely ground pasta made from semolina, a type of wheat. Why do I love it? It’s versatile, healthy (loaded with protein, selenium and potassium) and it’s quick to prepare. 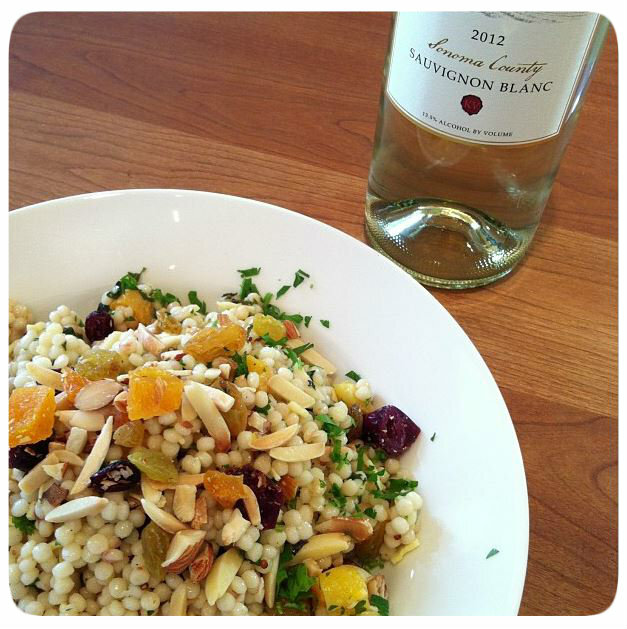 Today’s recipe is a beautiful fusion of Israeli couscous (pearl couscous), dried fruits, fresh herbs, local cheese and nuts inspired by friend and Executive Chef, Robin Lehnhoff-McCray. This easy lunch or light dinner option pairs perfectly with a nice crisp Sauvignon Blanc and a warm afternoon on the patio. Enjoy and cheers to the warmer days ahead! Combine all ingredients in a large bowl. Chill for 1 hour then serve.